Learn how to use OmniFocus in concert with your Calendar to manage commitment levels and to help ensure that things get done. OmniFocus and your calendar both serve important roles in your productivity system. When these tools are used effectively, you’re clear on what needs to be done and intentional about setting aside time to complete your tasks and projects. This session focuses on best practices for using your calendar alongside OmniFocus and includes techniques for conveniently integrating these two tools. Determining what goes in your calendar and what belongs in OmniFocus. 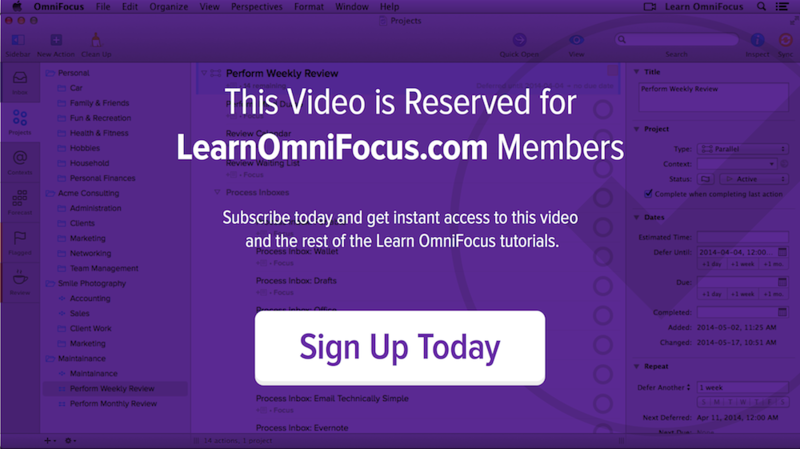 Efficiently entering defer and due dates using OmniFocus for Mac. Using OmniFocus’ Forecast perspective to help manage your commitment level. Automatically displaying OmniFocus items that are due soon on your calendar. Colour-coding your calendar to help ensure that all areas of your life are getting the appropriate amount of attention. Using the integration between OmniFocus and the Mac Calendar app for blocking off time in your calendar for actions, groups of actions, projects and areas of focus. Creating appointments that link to OmniFocus actions, projects, groups and folders. Making use of advanced integration between OmniFocus 2.2 (or later) and Fantastical 2.0.5 (or later) for Mac. Accessing OmniFocus from appointments on your iOS device using the Calendar, Fantastical for iPhone and Fantastical for iPad. These same techniques will also work on most other calendar apps for iOS. Conveniently creating appointments that reference OmniFocus using Calendar Paste for iPhone. Saving time scheduling time with other people using web based booking services, including Doodle and ScheduleOnce. Threefold Nature of Work — This GTD principle was briefly mentioned during the session. It’s recommend that you read a summary of this concept (PDF) written by David Allen for a more complete explaination. Also visit our Getting Things Done® (GTD®) Resources library for more information on GTD. Integrating OmniFocus and Fantastical — Check out our Using OmniFocus with Fantastical 2 for Mac to learn more about integrating these apps.